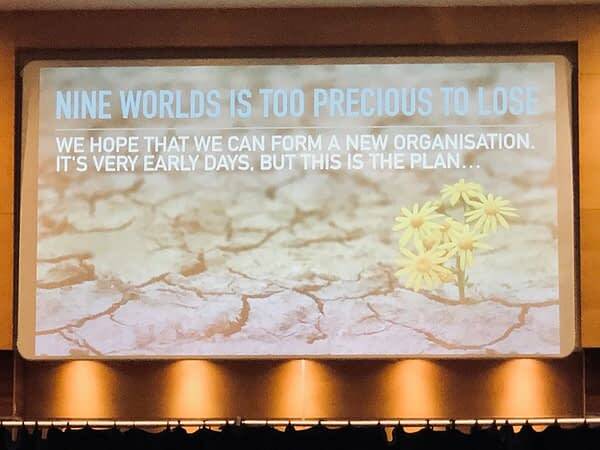 A open meeting was held at Nine Worlds this afternoon in Hammersmith, London about the show’s future after this weekend. I couldn’t make it due to a sudden emergency, but it seems there was a lot to be said and a lot of people to say it to. A full statement from Nine Worlds director Daniel Johnston (no relation) has been posted online. Basically, the current ownership of the show is to be dissolved, with assets and liabilities transferring to a new non-profit Nine Worlds. This will also mean that current director Dan and current shareholders can step away from the show. And Dan is doing so. There have been issues with show organiser burnout (and I did see evidence of that over the weekend given the show’s mammoth task to put on). Dan has pointed out he has worked for two years for free and with the show in massive debt two years ago, stepping away would have plunged the business into collapse. Since then, Nine Worlds has turned that around to a debt of merely £5000, which Dan is going to cover as a loan to the show. And Nine Worlds can be redefined in terms of who runs the show, who it’s for, what it stands for, and what people should expect from Nine Worlds. Nine Worlds 2019 is pencilled in with current location Novotel London West in Hammersmith for 9-11th August 2019. Dan is inviting anyone — but especially current contributors, to be involved in creating, running, or staffing the new Nine Worlds — and asks that all complete this form by 9th September. An attempt at a live-tweet. Please bear with me with this one. I won't be able to answer questions immediately. K: Some requirements look scary. They have been discussed, and they come from a place of avoiding anyone else ending up in Dan's situation.